I was asked if I’d like to review a nail lacquer and I wasn’t going to say yes, because I honestly haven’t the first idea about nails. Or make up in general, actually. But then I remembered that my lovely friend Emma is completely and utterly obsessed with them and I knew she’d be perfect for a guest post. So I’ll hand you over to Emma and her perfectly painted nails. I’m a bit of an obsessive when it comes to nail varnish/nail polish/nail lacquer. I adore it. My current collection totals 92 and the majority of those are on pretty stands in my lounge for everyone to admire, much to the chagrin of my long suffering (and now rather poor) husband. Nail polish is fabulous for a little & relatively cheap pick me up during these miserable winter months and a pampering manicure, even at home, is good for the soul. I like to wear bright colours in the winter when my mood is low, pretty pastels for spring, sky blues during our all too brief summer and earthy browns, greys and neutrals in the Autumn. When Karen asked me to have a look at a nail polish she’d been sent I jumped at the chance! I hadn’t heard of the brand before and the colour, a beautiful vibrant orange was shockingly not in my repertoire. In fact it was seriously out of my comfort zone which made me all the more excited to try it. Add in that the brand is called Nella Milano & Nella just happens to be my all time favourite girls name, and I was sold. 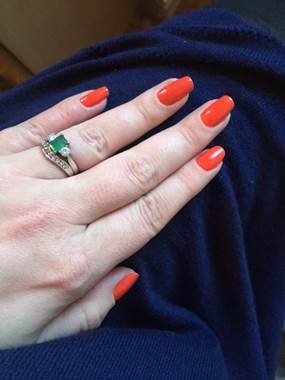 The colour, Crystal Coral is a bright, deep orange, not your usual tangerine shade but darker and more vibrant. It isn’t a coral type shade at all confusingly. The lacquer went on pretty evenly and although I applied two coats I think three would have achieved a more consistent opaque finish. However, I was more than pleased with the opacity of the two coats. I didn’t add a top coat so I could see how long the polish lasted and as I’m typing this on day five and I have just a tiny bit of wear at the ends of my nails, I am pretty impressed! Even with a top coat I rarely get more than three days chip free. As a busy working mum, I’m always doing something whether it be laundry, washing up or tap tap tapping on a keyboard for 8 hours a day and I’ve been pleasantly surprised by the length of wear from Nella Milano. I especially liked wearing this on a cold, grey day with a navy blue dress. As you can see navy & orange are a brilliant combination and I was nicely cheered up by the bright colour on such a drab day! I think this would be a fabulous colour for a holiday pedicure! Of course the big test is always, would I pay actual money for it? 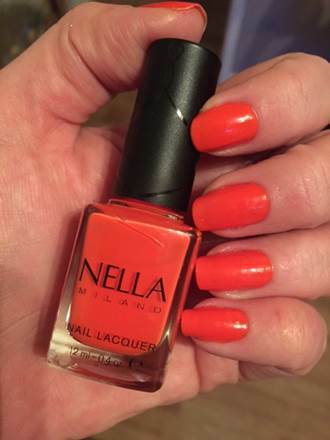 Nella Milano nail lacquers retail at £8.95 on their website and I would happily pay that. 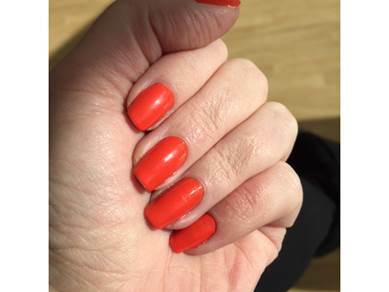 The longevity has been the best of any nail polish I’ve used (I’m a bit of a budget girl normally but I can see that paying a little more here is worth it) and there’s a decent range of colours which I’d love to try. Definitely a beautifully painted thumbs up from me! Now you know how great Nella Milano polishes are, why don’t you enter to win one? All you need to do is complete the easy peasy Rafflecopter widget below.